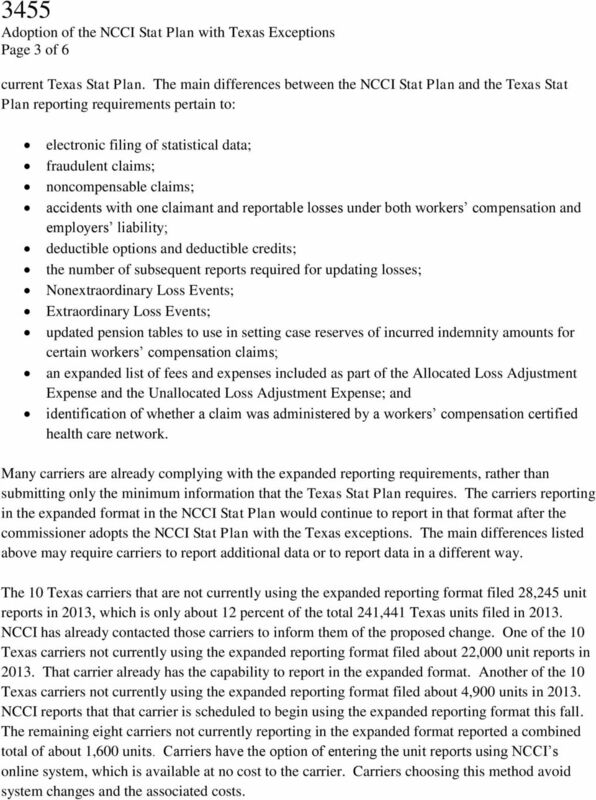 Download "TEXAS DEPARTMENT OF INSURANCE EXEMPT FILING NOTIFICATION UNDER TEXAS INSURANCE CODE CHAPTER 5, SUBCHAPTER L, ARTICLE 5.96"
3 Page 3 of 6 current Texas Stat Plan. 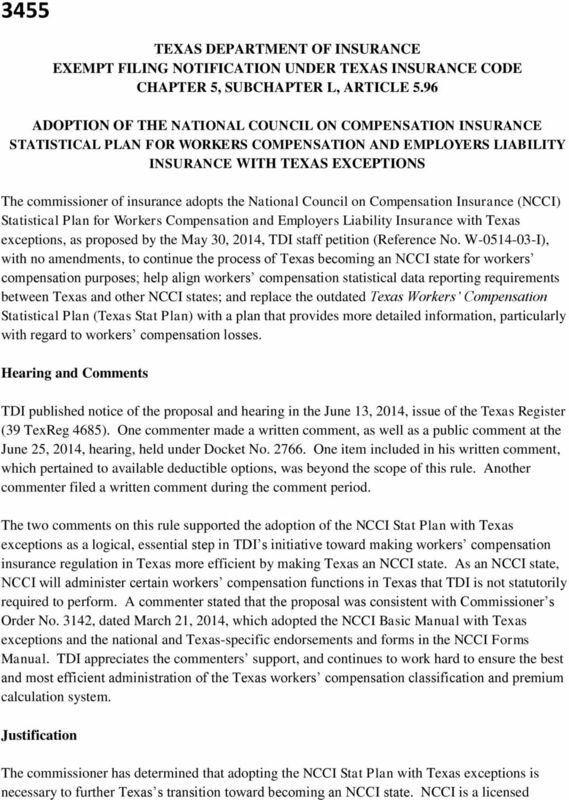 The main differences between the NCCI Stat Plan and the Texas Stat Plan reporting requirements pertain to: electronic filing of statistical data; fraudulent claims; noncompensable claims; accidents with one claimant and reportable losses under both workers compensation and employers liability; deductible options and deductible credits; the number of subsequent reports required for updating losses; Nonextraordinary Loss Events; Extraordinary Loss Events; updated pension tables to use in setting case reserves of incurred indemnity amounts for certain workers compensation claims; an expanded list of fees and expenses included as part of the Allocated Loss Adjustment Expense and the Unallocated Loss Adjustment Expense; and identification of whether a claim was administered by a workers compensation certified health care network. 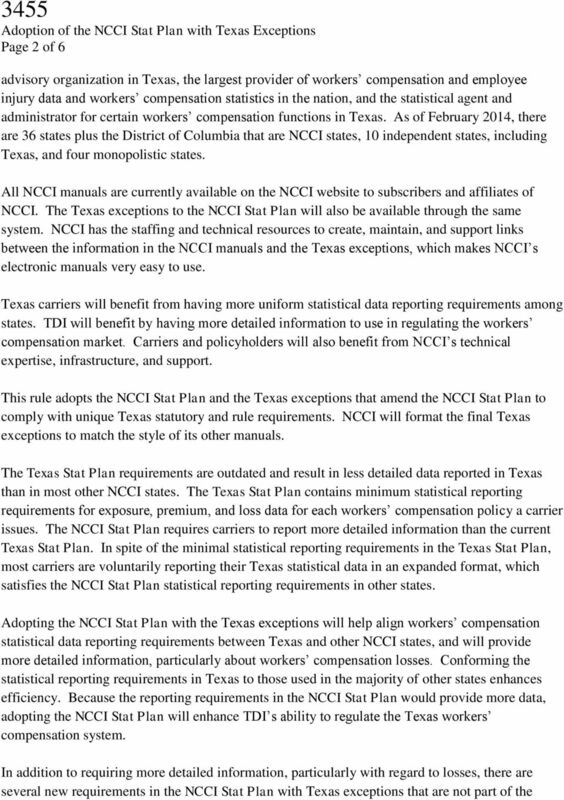 Many carriers are already complying with the expanded reporting requirements, rather than submitting only the minimum information that the Texas Stat Plan requires. 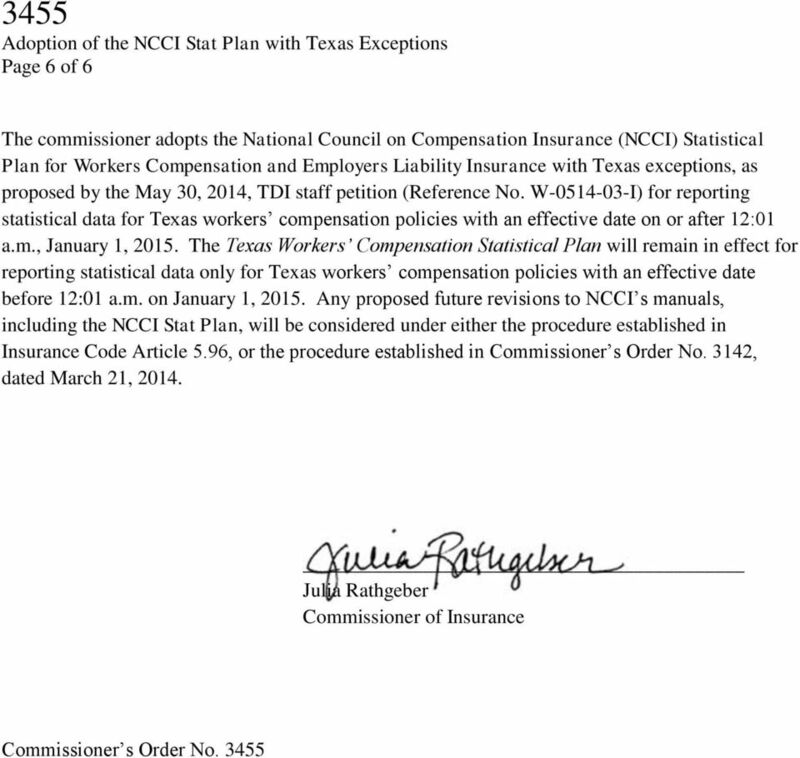 The carriers reporting in the expanded format in the NCCI Stat Plan would continue to report in that format after the commissioner adopts the NCCI Stat Plan with the Texas exceptions. The main differences listed above may require carriers to report additional data or to report data in a different way. The 10 Texas carriers that are not currently using the expanded reporting format filed 28,245 unit reports in 2013, which is only about 12 percent of the total 241,441 Texas units filed in NCCI has already contacted those carriers to inform them of the proposed change. One of the 10 Texas carriers not currently using the expanded reporting format filed about 22,000 unit reports in That carrier already has the capability to report in the expanded format. Another of the 10 Texas carriers not currently using the expanded reporting format filed about 4,900 units in NCCI reports that that carrier is scheduled to begin using the expanded reporting format this fall. The remaining eight carriers not currently reporting in the expanded format reported a combined total of about 1,600 units. Carriers have the option of entering the unit reports using NCCI s online system, which is available at no cost to the carrier. Carriers choosing this method avoid system changes and the associated costs. SUBCHAPTER RR. STANDARD PROOF OF HEALTH INSURANCE FOR MEDICAL BENEFITS FOR INJURIES INCURRED AS A RESULT OF A MOTORCYCLE ACCIDENT 28 TAC 21. 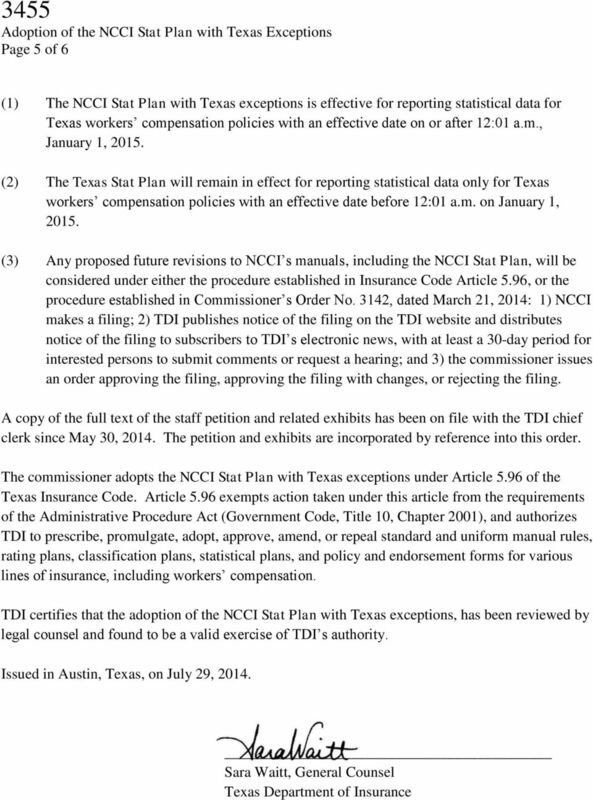 Part I. Texas Department of Insurance Page 1 of 14 SUBCHAPTER RR. STANDARD PROOF OF HEALTH INSURANCE FOR MEDICAL BENEFITS FOR INJURIES INCURRED AS A RESULT OF A MOTORCYCLE ACCIDENT 28 TAC 21.5201 1. INTRODUCTION. CHAPTER 3. LIFE, ACCIDENT, AND HEALTH INSURANCE AND ANNUITIES Subchapter QQ, Provider Network Contract Registration 28 TAC 3.9801 3. Part I. Texas Department of Insurance Page 1 of 23 CHAPTER 3. LIFE, ACCIDENT, AND HEALTH INSURANCE AND ANNUITIES Subchapter QQ, Provider Network Contract Registration 28 TAC 3.9801 3.9805 1. INTRODUCTION. 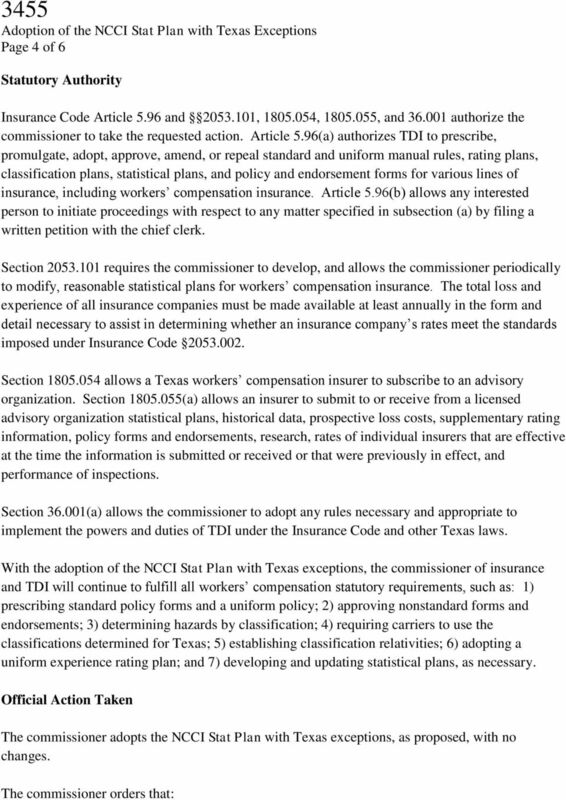 Part I. Texas Department of Insurance Page 1 of 15 Chapter 5. Property and Casualty Insurance. Part I. Texas Department of Insurance Page 1 of 15 SUBCHAPTER H. CANCELLATION, DENIAL, AND NONRENEWAL OF CERTAIN PROPERTY AND CASUALTY INSURANCE COVERAGE 28 TAC 5.7001, 5.7002, AND 5.7009 1. INTRODUCTION. VERMONT DEPARTMENT OF BANKING, INSURANCE AND SECURITIES REGULATION 91-4b MINIMUM REQUIREMENTS FOR COMPLIANCE WITH 8 V.S.A. Steven M. Goldman, Commissioner, Department of Banking and Insurance. N.J.S.A. 17:1-8.1, 17:1-15e and 17:23-20 et seq. Massachusetts Statistical Accepted Edit List 000058 Exposure Class Code - Codes 0063 and 0064 should not be on the same policy. Premium discount class codes 0063 and 0064 should not be on the same policy. Added by Acts 2003, 78th Leg., ch. 1274, 3, eff. April 1, 2005.